“The European Union was formed in order to take advantage of us on trade, and that’s what they’ve done,” Trump said in a televised interview on CBS. President Donald Trump: I get along with him. It’s very important. China, let’s go. President Donald Trump: $250 billion. Lesley Stahl: Gonna do more? Lesley Stahl: –trade war right now. Trade war. Lesley Stahl: –you did today. President Donald Trump: I called it a skirmish. Lesley Stahl: I heard you, you called it a war. President Donald Trump: I called it, actually I called it a battle. But, actually, I’m gonna lower that. I consider it a skirmish. And we’re gonna win. Lesley Stahl: You have also slapped some tariffs on our allies. President Donald Trump: I mean, what’s an ally? We have wonderful relationships with a lot of people. But nobody treats us much worse than the European Union. The European Union was formed in order to take advantage of us on trade, and that’s what they’ve done. Lesley Stahl: But this is hostile. President Donald Trump: And yet, they– it’s not hostile. Lesley Stahl: It sounds hostile. President Donald Trump: You know what’s hostile? The way they treat us. We’re not hostile. President Donald Trump: –the stupid country for so many years. Lesley Stahl: Are you willing to get rid of that Western alliance? Lesley Stahl: Well, answer my question. Although Donald Trump in the above related to trade said, “we’re gonna win,” Europe, for a prophesied time at least, will eventually ‘win’ the trade war. Essentially Europe will dominate world trade. This will not go as well for the USA as its President Trump hopes. I have been warning since before he became president that there would be “unintended consequences” of his policies. We are seeing “fallout” (unintended consequences) of Donald Trump’s policies affecting Europe. Europe’s relationship will NOT continue in the future with the USA as it has been–that is one reason that Europe is developing its own military (see also With PESCO, EU entering a ‘New Era’: An era that will NOT end well for the USA, Canada, or the UK). 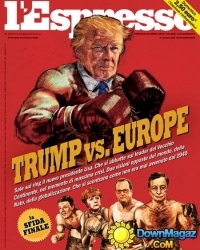 While the Europeans do not want to overly rile up Donald Trump, they are more and more of the opinion that he does not like them (and his relatively recent statement about the EU being a foe basically confirms that–see Donald Trump considers European Union, Russia, and China to be foes; Germans fear Donald Trump more than Vladimir Putin). He is the one whose policies have them scrambling to try to figure out what to do next. “Self-preservation” can be a powerful motivator. So what does the outcome mean for German politics as a whole? Mainstream parties have been hemorrhaging voters in recent state elections and especially in last year’s federal election: The major parties that have dominated German politics for decades and currently rule at national level in a coalition made up of the Social Democrats (SPD), the CDU and the CSU, are in decline. The latest debacle could very well spell the end for a coalition that none of the parties really ever wanted in the first place and that in the eyes of many voters is muddling through rather than shaping crucial policies, ranging from immigration to pensions. if the CDU and the SPD experience another drubbing, all bets are off on the grand coalition surviving. That could mean new elections, a CDU-run minority government, or another attempt to form a Jamaica coalition, made up of the CDU, the CSU, the pro-business Free Democrats and the Greens and so named because of the parties’ respective colors: black, yellow and green. Repercussions will be more than how one politician is affected. Europe will change and become militaristic. Donald Trump, by pressuring the EU to spend more on defense, is pushing Europe to fulfill its prophesied destiny in the end of this age. Donald Trump’s words and actions are a factor that will contribute to the rise of the European King of the North Beast power. Despite his hopes, this will not end well for the USA (Daniel 11:39; Habakkuk 2:6-8). This entry was posted on Monday, October 15th, 2018 at 6:00 am	and is filed under Prophecy.